But, no matter, a dog with a docked tail wins again. It was third time lucky for Phillipe, a Giant Schnauzer. Clare Coxall is the Crufts 2008 Best in Show judge; she won Best in Show in 1966 with a Toy Poodle. That's the Mistress's year of birth, as it happens. Anyway, I digress. Big Phil (NOT Phil Scolari!) the Giant Schnauzer, aka Ch Jafrak Philippe Olivier was the winner of the Working Group. He is owned by Mr & Mrs Cullen from St Leonards-on-Sea in East Sussex. In spite of all the hype and the scandal (has Crufts 2008 been rigged? Really? 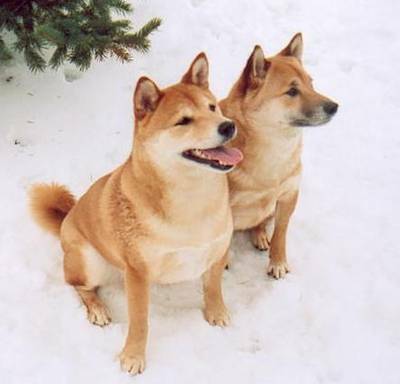 ), my money's on the Shiba Inu to win Best in Show. OK, I'll come clean; I am not sure this dog will win because there will be calls of "fix, fix, fix" but I have another reason to mention the Japanese dog. My lovely, gorgeous friend, Lillie, sadly passed away last month. Lillie showed me what it was to be a really classy girl. A foxy lady in the true sense. Those experts on the BBC reckon it will be third time lucky for the Giant Schnauzer; I don't know, maybe they know something I don't. As with any award where there can only be one winner, comes the agonising process of deciding just who deserves the top prize. The Crufts annual Friend for Life award, sponsored by the Kennel Club, is no exception. Each year, I give my view about who I think will win although - truth be told - all of the dogs are already winners, as are their owners. This year seemed EVEN harder than last, which was even harder than the year before! My heart says - as Loolapaloola (see comments) has rightly guessed - the black Labrador, Percy should win because...he's a Lab! And he's an assistance dog, which means he has changed someone's life in the most profound way. But I must spread my support around and, in the past, I have given the paws up to Dogs for the Disabled, a wonderful organisation. My conscience says - particularly with all the negative press at the moment - the soldiers' dogs deserve to win, in recognition of their owners' heroic efforts. But, this year, I'll be guided by the Mistress. She burst into tears when she saw Yepa in action, well, more precisely when Yepa's owner said that she believed Yepa was her best hope of walking. There is something really amazing about all assistance dogs - no doubt about it - but when you see that special bond between a child and their dog, well, it's a testament to both owner and hound what can be achieved. In the meantime, here's what the BBC has to say about each finalist - WITH the contact details to phone - don't leave it too late. Every vote counts! Linda Bruce was a truck driver until major surgery on her back left her unable to continue the job she loved. At that time she met Sadie, the German Shepherd, who had recently been rescued by the RSPCA. Together they've helped each other pull through. Dogs for the Disabled trained Percy to be a 'autism assistance dog’ – providing 6 year old William Johnson with a much needed lifeline. With Percy at his side, William has the reassurance and confidence to visit new places. Nowzad and Tali were fighting for survival on the streets of war-torn Afghanistan when Sergeant Paul Farthing came across them whilst he was serving with the Marines. Bringing them to safety meant embarking on a dangerous 4,000 mile journey to bring them to their new home in the UK. Two years ago Hazel Carter damaged her back and was left in constant pain and virtually housebound. Unable to do even the simplest of tasks, she trained Connie, her Newfoundland, to be her very own Personal Assistant. Cerebral Palsy has left 11 year-old Harriet Ringsell with severely restricted movement. Best friend Yepa, her Hungarian Wirehaired Vizsla has given Harriet the encouragement to overcome her disability. Thanks to Yepa, Harriet now believes she has a chance of walking again.